A Tulane professor visiting the New Orleans gallery with her class this week asked me about George’s connection to voodoo. 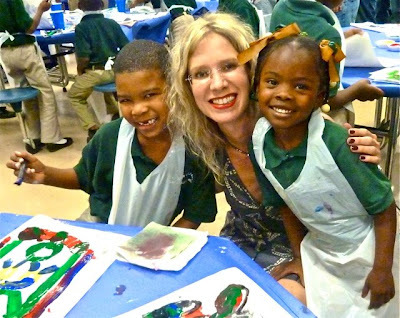 Although I’m sure she intended nothing of the sort, her question reminded me of the only negative comment we received in response to the 2008 Rodrigue exhibition at the New Orleans Museum of Art. A woman wrote in, alarmed at George’s depictions of what she described as ‘voodoo and black magic.’ Although I tried to calm her down, I found it hard to deny this observation, simply because George explores all kinds of concepts on his canvas. I thought about The Traiteur and his belief in the Cajun folk healer, along with his frequent use of candles and a fairly visual, if not literal, painted mysticism. 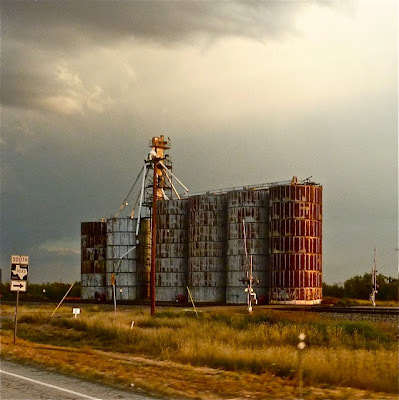 I reassured her that he doesn’t advocate any sort of religion or worship through his art or otherwise, not even the Catholicism that was an inseparable part of his childhood in New Iberia, Louisiana. From his earliest Cajun paintings, however, George explored the supernatural in his artwork. The Cajuns, he says, glow with an inner light, their culture shining out, defying what should be dark shadows beneath the oaks. He paints the people as though they are ghosts, floating and yet locked into the landscape, framed by the trees and yet timeless, caught within their culture, unable to change or to move. 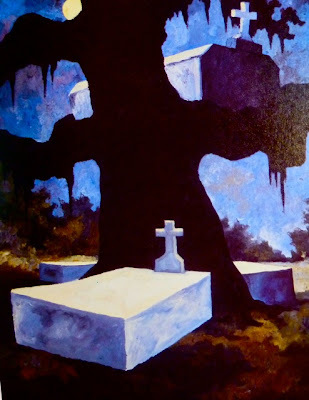 Perhaps his youth and his work in his father’s tomb business influenced this symbolism, as he remembers the crypts and their bodies floating above ground and even caught or trapped in the trees after a flood. 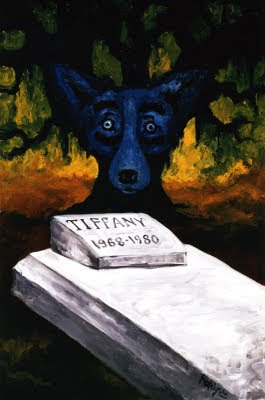 The Blue Dog also emerges from its grave as a spirit, caught like the Cajun people in the oak tree, a symbol of south Louisiana. George’s earliest related silkscreen is Spirits in the Trees, an original print created in 1992 and pictured in its main edition at the top of this post. This also was his first exposure to the split-font technique. He and his printer pulled the paper by hand while experimenting with added colors. This resulted in variegated backgrounds of these ‘split-font’ prints, so that in the case of Spirits in the Trees, the sky blends from one color to the next. As a result, each print in the split-font edition varies, leaving no two prints exactly alike. 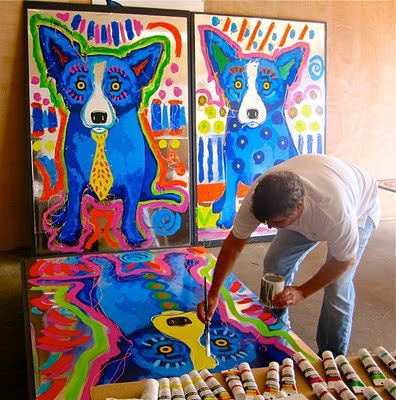 As described in the post “Blue Dog: The Silkscreens,” most of George’s prints are original images, meaning that they do not begin with paintings. In the case of Spirits in the Trees, for example, he started with a unique design on tracing paper. His printer cut the plates accordingly and then followed George’s instructions regarding color. The result is far more interesting than the average print. 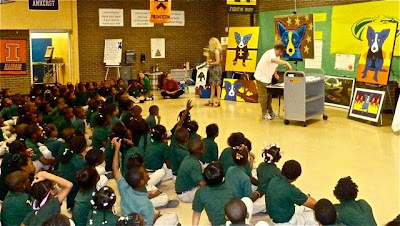 Indeed, it is best described as print-making as an art form. 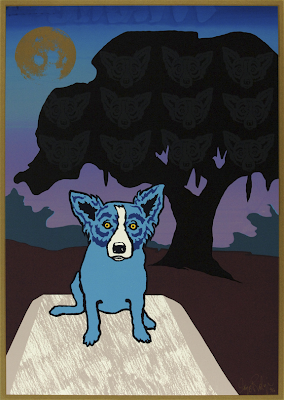 In Spirits in the Trees, a simple Blue Dog sits on a grave in a controlled environment, no different than if it is Evangeline or a figure from Bodies. 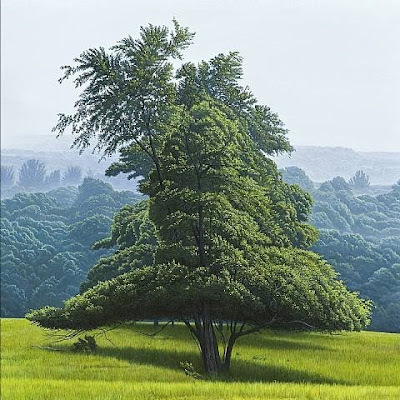 It is a shape no more or less strong than the oak tree, the moon, or even the sky as defined by that space between the bottom of the branches and the top of the bushes. Without asking him (because even I don’t have the nerve), I’m sure that voodoo and spirits and the afterlife never entered his mind as George created this highly structured design. And yet, within the tree hide faces, easy to miss without a careful look. It’s unusual for George to include something so subtle; and therefore, it must be important. Having discussed with him many times topics such as spirituality and mysticism and the possibility of past lives, I can’t help but wonder if just maybe, even if it’s after the artistic fact, the spirits really are in his trees. There was a time, other than The Waltons and Little House on the Prairie, that doctors made house calls. A time before waiting rooms and diagnostic centers and ten minute speed-treating, when doctors traveled to homes in the middle of the night, held their patient’s hand, and worried alongside panicked relatives. There was also a time before insurance, before emergency rooms and HMO’s, a time when doctors accepted not only modest payment, but also chickens and vegetables and home-cooked meals. They more likely traded their services for goods rather than money, and their dedication established them as folkloric and cultural heroes in the bayou country. 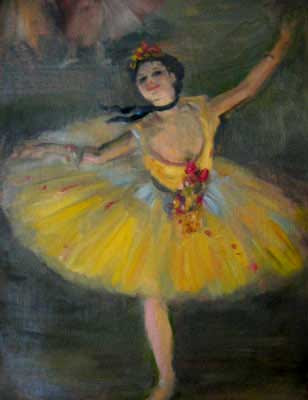 For his painting, just as with his original Jolie Blonde of 1974, George created his subject from his imagination. 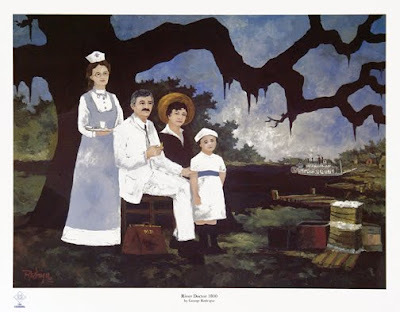 So imagine his shock when Lawrence Pugh, a good friend and a long-time member of the New Orleans Gallery staff, brought him several photographs of his great grandfather, a country doctor from Napoleonville, Louisiana with a remarkable likeness to the doctor in the painting. According to Lawrence, his great-grandfather was a miracle child, plucked from the floodwaters at age three by a slave during the Last Island hurricane of 1856. 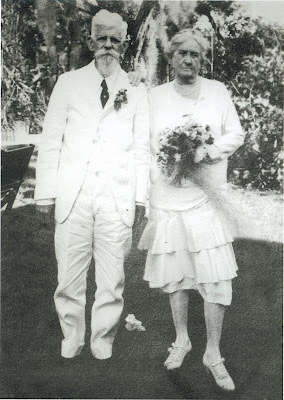 * Saved by an unnamed hero, he became a hero himself, the only coroner for many miles, living to age ninety-eight, and awarded by the community on the occasion of his fiftieth wedding anniversary with a brand new car, a Ford Model T.
Like the distinguished Dr. Pugh, George’s Doctor on the Bayou knows local respect, reflected in his solitary, yet approachable and confident stance, prepared with his doctor’s bag for a house visit. 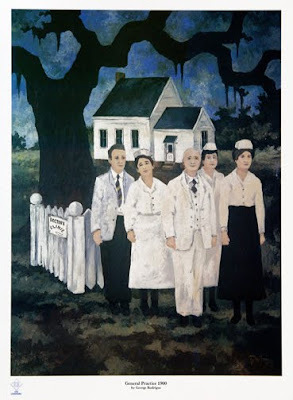 In the painting, he stands not in shadow, but all in white, glowing like a ghost and framed within the dark oak tree, locked into Louisiana as an inseparable part of its culture. He stands on a dock where he could just as easily step onto a road as a river, reminding us that the Bayou Teche and the Mississippi River also transported these early physicians. 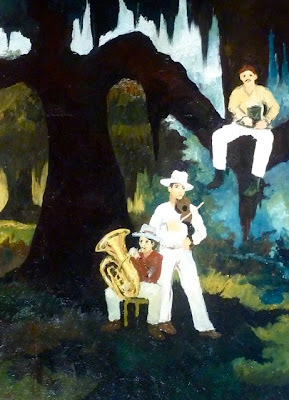 For the painting River Doctor 1800 (above), commissioned along with the two paintings below by a Baton Rouge Hospital in the mid 1980s, Rodrigue researched old Louisiana medical photographs. The doctor with his nurse and family rode the riverboat (visible in the distance) to small villages, caring for the people that lived along the river. George again researched old photographs to paint General Practice 1900 (above), depicting a later phase in medical history when small hospitals, wooden structures, provided permanent offices and examining rooms, known as ‘country clinics,’ for physicians. 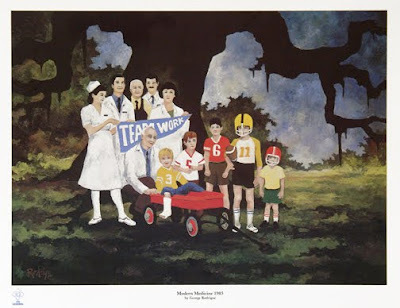 In the painting Modern Medicine (above), George compares the teamwork put forth by today’s Louisiana health care workers to that of a kids’ football team, including his sons, André (yellow helmet) and Jacques (red helmet). In the mid-1980s he found himself like most young fathers at his kids’ sporting events, and it was an easy connection for him to relate the team work of a hospital staff to the team spirit of a child’s football team. 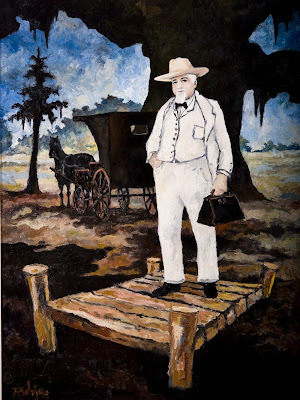 The original painting, Doctor on the Bayou, hangs in Lake Charles Memorial Hospital in Lake Charles, Louisiana. 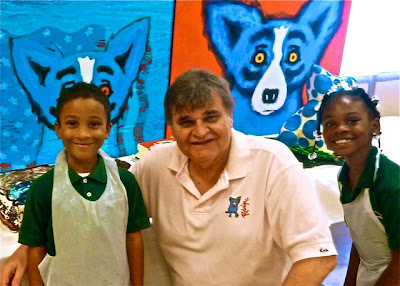 For information on the hospital’s ‘Art for the Soul Reception’ with George Rodrigue on November 11, 2010 contact Lake Charles Memorial Hospital. 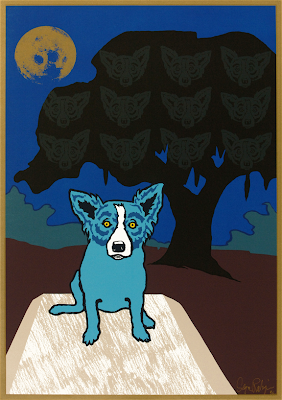 George Rodrigue recently produced a fine art silkscreen of his original Doctor on the Bayou. 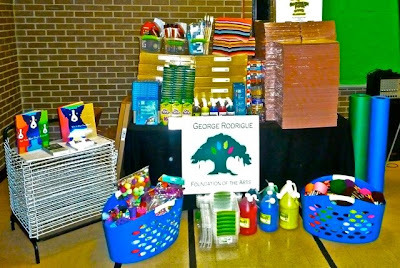 For information contact Rodrigue Studio. Coming this weekend: "Spirits in the Trees"
We took a short trip to New York this week as we met with publishers and celebrated the launch of Deb Shriver’s elegant tribute to New Orleans, Stealing Magnolias. With only a few hours to explore the city, I found myself once again with my museum pal Emer*, this time at the Morgan Library. Far from the contemporary abstract art I hoped to see at the Museum of Modern Art (which was closed), we encountered Edgar Degas’s drawings, a classical and familiar art history nook for us both. 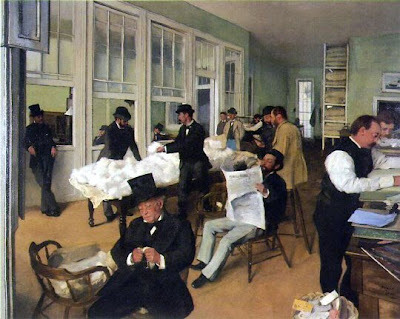 We all know Degas’s ballerinas and horses, and those of us in New Orleans especially are familiar with the cotton exchange, which he painted during his visit here in 1873. 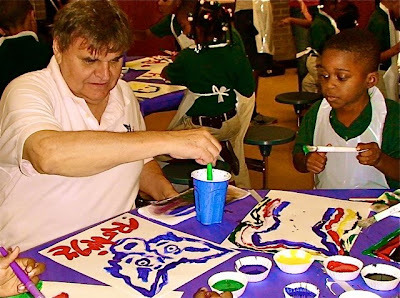 However, I was surprised to see in his sketches studies of the old masters, especially Michelangelo, the same drawings that inspired and indeed educated George Rodrigue as an art student. 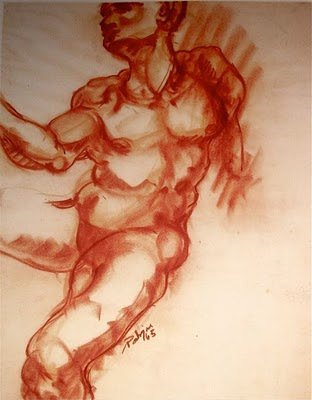 Both artists copied the old masters to understand the human figure. 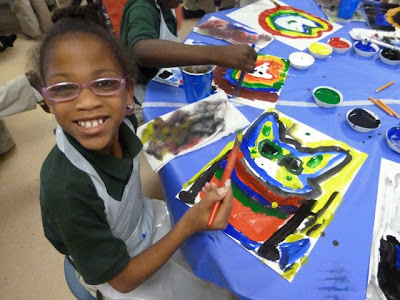 In addition, like Rodrigue, Degas (1834-1917) rarely took commissions, preferring his own passionate direction over the dictated instructions of someone else. 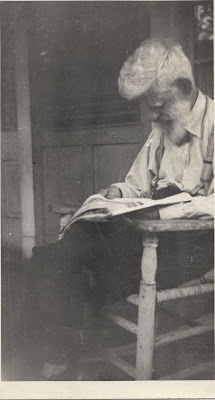 This independence lead him to experiment with various mediums, including print-making. 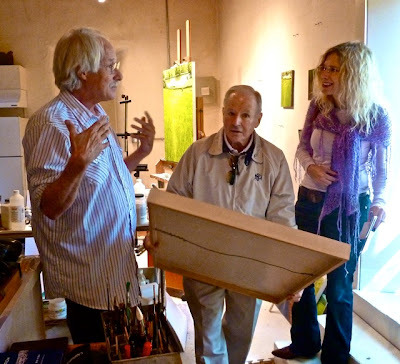 After last week’s visit with artist Woody Gwyn in Galisteo, New Mexico, I did not expect our impromptu discussion of monotypes to pay off so quickly. 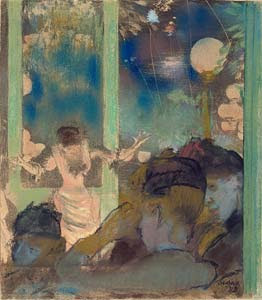 However, as Gwyn explained, it was Degas who embraced this medium with enthusiasm, adding paint to his prints and creating a form of mixed media. In the piece below, for example, he embellished (in 1885) with pastel a lithograph he originally printed in 1877. 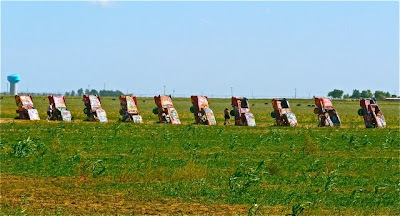 This reminded me in turn of George’s mixed medias. 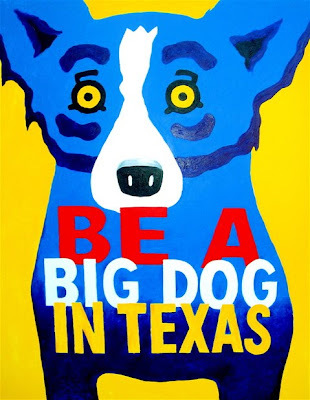 He paints on silkscreens, occasionally revisiting and reworking prints from years back, exchanging his easel and palette for the fun of garage walls and paint-from-the-can. 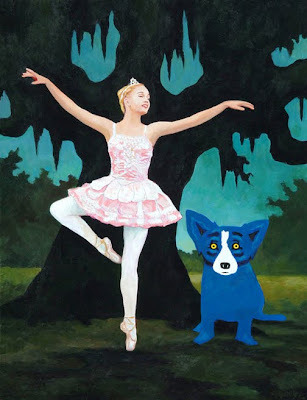 Furthermore, I couldn’t help but draw a connection between Degas’s ballerinas and Rodrigue's Blue Dog, and their effects on each artist's career. After years of painting, both artists achieved fame when the public embraced their new subjects. 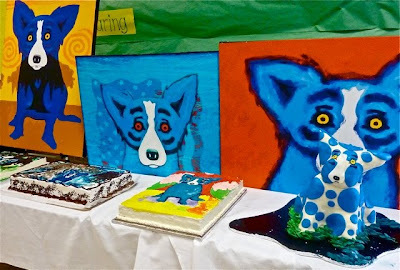 As with an earlier post on Picasso*(who was an avid collector of Degas’s monotypes and mixed medias), I do not presume to connect the styles of Rodrigue and Degas. However, there are certain similarities regarding their interests and artistic development that did cross my mind as I viewed the Morgan’s collection. Following the Degas drawings, Emer encouraged me to view the Roy Lichtenstein exhibition across the hall, specifically his black-and-white drawings of 1961-1968 (the same years George attended art school in Lafayette and Los Angeles). “Come on, Wendy. They’re just plain fun,” she said, in her expressive Irish accent. Despite the fact that it included five times the number of pieces, Emer and I blew through the show much faster than the Degas exhibition. 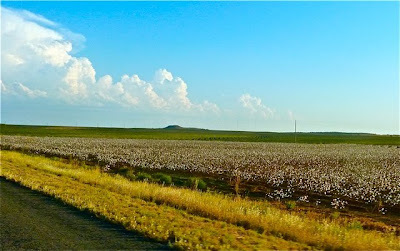 There’s not a lot to study, not much to say beyond the overall clever and (certainly at the time) innovative concept. Hey, I like cliché too! 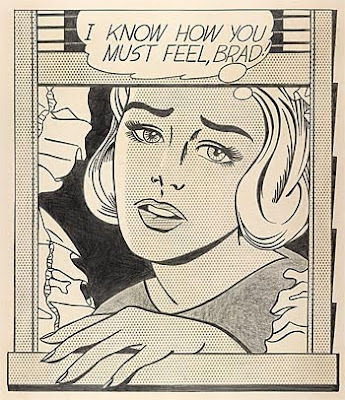 And this candor, the willingness of Lichtenstein to admit his insensitivity and “sort of mindless drawing,” ironically renewed my interest … and my passion. 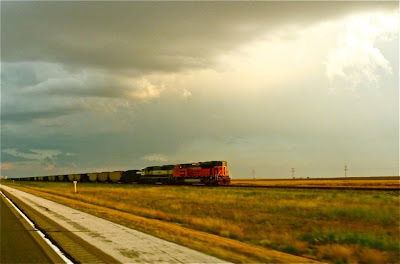 This month we crossed the country for the second time this year, unable to resist the American West and especially the draw of Santa Fe. 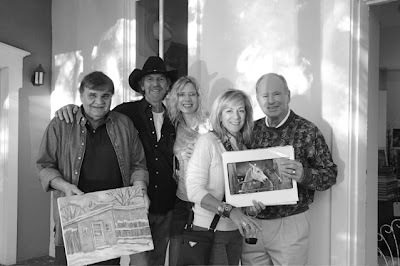 George sketched, photographed, and designed, inspired by the place and its people, in particular a journey to Galisteo, an artist’s community thirty miles south of the New Mexico capital. 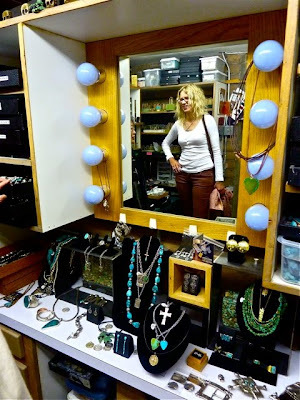 We also enjoyed, thanks to the connections of our friends and collectors Chris and Don Sanders, a private tour of the hidden treasures below the Gerald Peters Gallery in Santa Fe. Our guide, Abigail, shared with us life-size horses by Deborah Butterfield, thickly-painted landscapes by Wayne Thiebaud (famous for his paintings of petit fours and hors d’oeuvres), and the real prize, an original Alfred Stieglitz photograph (below) of his long-time lover, Georgia O’Keeffe (a photograph valued at more than one million dollars). 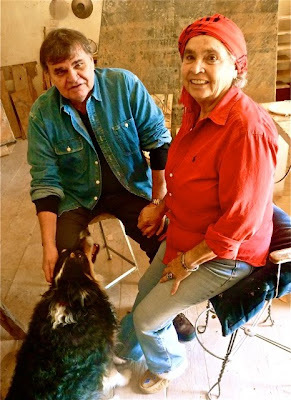 In Galisteo we visited Woody Gwyn, an artist who paints landscapes and, ironically, seascapes within the 18th century hacienda he shares with his wife Diana. 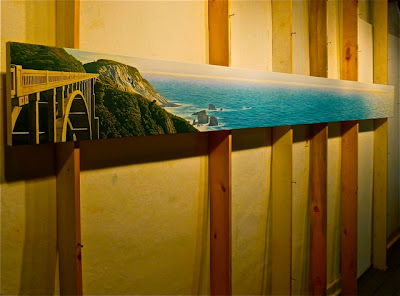 We found him working on a long narrow canvas (one foot by fourteen feet) of Bixby Bridge and the Pacific Coast, an area well known to us on California’s Highway One, and a seemingly odd choice within this land-locked, historic Spanish colonial town. 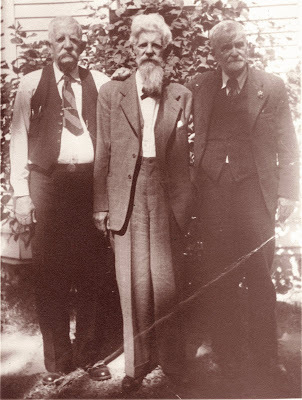 The Gwyns are the third family in three hundred years to own the Doris-Ortiz hacienda. Built in 1703, its rafters originated with the church built on the same site in 1675. 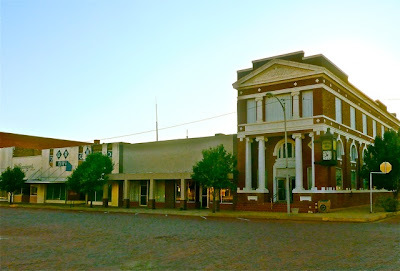 The new structure began as a Spanish trading post, followed by a dance hall and casino, and when the Comanche Indians raided Galisteo in 1712, the women and children hid in the house’s courtyard during the battle. 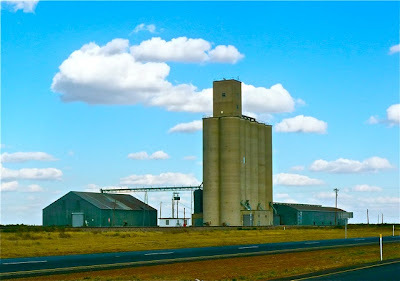 In 1846 the structure became a U.S. cavalry outpost, followed by a general store and finally a bar, popular with movie stars in the 1950s. Most notable, Archbishop Lamy (1814-1888) made the arduous journey from Lyon, France to Galisteo, New Mexico during the mid-1800s. 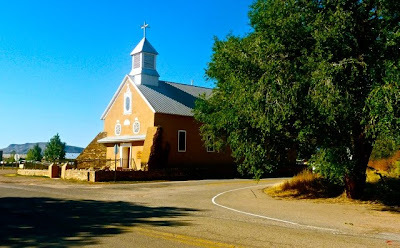 He lived in a modest room within this same house as he supervised construction of the new church, located just across the street, the only asphalt today in Galisteo, a road paved in the 1940s to ensure safe travel of the atomic bomb to the Trinity site. “When you live here, you understand we’re all very temporary and it’s just our turn to take care of things,” explained Diana. You do realize, Woody, no one paints like this anymore. 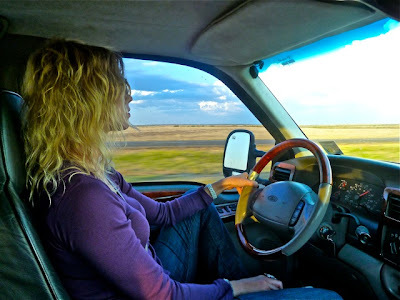 From the Gwyn home, we crossed the dirt road to Priscilla Hoback’s hacienda. 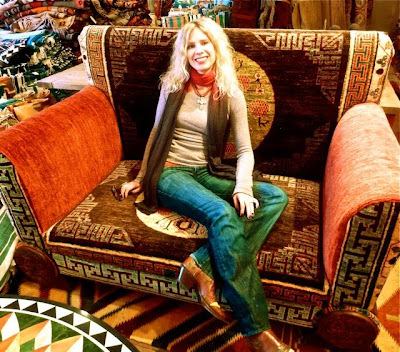 A painter and sculptor, Hoback moved to Galisteo in the 1970s. 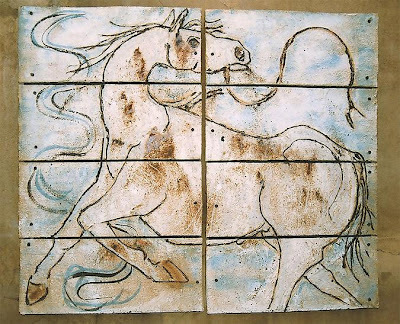 She mines her own clay and colors, firing her heavy wall pieces inside a kiln she made herself, located within the walls of her three hundred year old house. She questions George about his work, and I sit on the side and watch these artistic friends show genuine interest in each other’s projects. 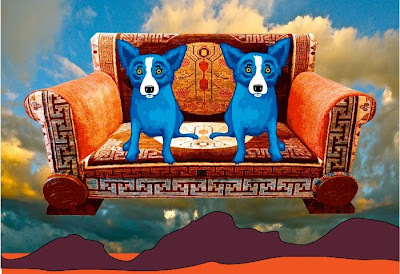 George and I love them, and we bought one, a painting of an adobe house in the snow, foreshadowing the Christmas holidays we’ll spend in Santa Fe this December. 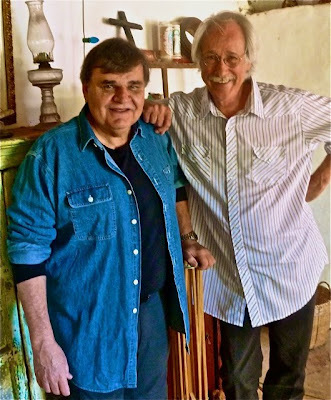 It is in Santa Fe that George experiences artistic camaraderie. He admires these artists, their works, and their techniques. 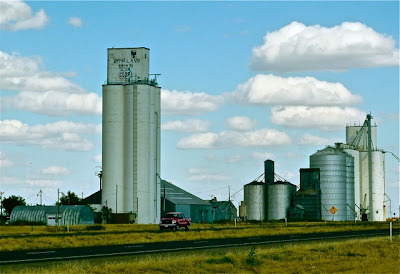 He gets lost in discussions of kilns, photography, and turquoise, almost shy when Woody suggests they work on monotypes together during our next visit, or when Priscilla hints (with obvious admiration) for signed copies of his latest books. 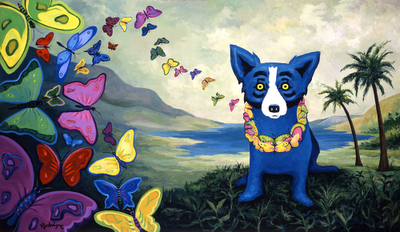 He feels understood here in a way that eludes him in south Louisiana, an area where, perhaps just because it’s home, the Blue Dog as a concept supersedes the Blue Dog as a piece of art, where public familiarity and misunderstanding blur the artistic, symbolic, and even civic intent of his work as far back as his Landscapes and Cajun Paintings, and where the Blue Dog Man overpowers the curious, intense, small-town (at heart), down-to-earth and devoted (always) friend, George Rodrigue. 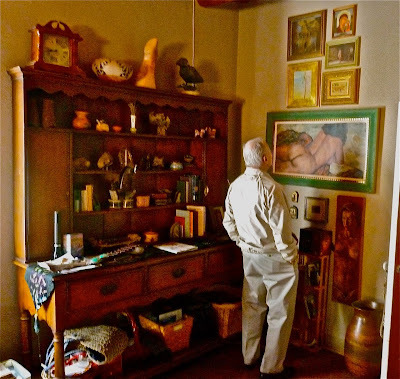 to learn more about Rodrigue’s Santa Fe history and paintings, see the post “Rosalea Murphy, the Pink Adobe, and Paintings of Evergreen Lake"